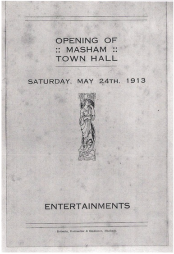 MoM is producing a booklet of Town Hall activity over the last 100 years based on our successful exhibition in 2013. Do you have old photos of the Town Hall we could copy? Can you share your memories and stories with us – in writing or over a cup of tea? Was your family involved in running any of the activities over the last 100 years and you have club papers or archives we could look at? Do you remember the wrestling or the Scalextric? Did you come to the dances? What are your early memories of cinema? Did you visit the building during the war?